The features of Strongwell's fiberglass products offer significant benefits in many architectural applications. STRONGRAIL® architectural railing and fencing systems are a strong, attractive and safe solution to your structural needs. 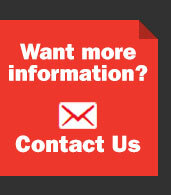 The standard systems are fabricated from pultruded fiberglass components produced by Strongwell and molded thermoplastic connectors. Systems can be made to meet ADA requirements, adding safety and beauty to your property. 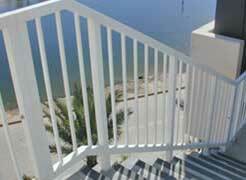 Custom railing and fencing systems are also available in a variety of colors, pickets, and rails. 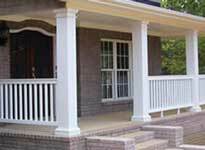 Fiberglass railing and fencing systems add safety and beauty to your property. Strongwell’s industrial fiberglass decking systems are attractive, low maintenance industrial decking systems that are excellent alternatives to traditional decking materials that rot and chip. SAFPLANK® and SAFDECK® will not rot, rust or mildew, which makes those decking systems ideal for high-moisture environments, including saltwater. The fiberglass panels are designed to interlock for a continuous solid surface and provide an aesthetically pleasing appearance. The Vintage Club is one of America’s most prestigious country club communities. Located at the base of Eisenhower Mountain in Indian Wells, California, the Vintage Club blends natural beauty with sophisticated architecture. 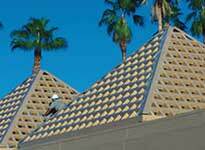 Throughout the club, pyramid shaped screens accent rooftops and conceal the facility’s air-conditioning units. The dual purpose screenings were constructed from structural timber and required approximately $75,000 in maintenance costs, every other year. The timber’s quick deterioration, caused by the desert’s thermal cycling, combined with the mounting maintenance costs were driving factors in the Vintage Club’s exploration for a cost effective, long-term replacement. Harrington Plastics, a distributor of Strongwell products, recognized the club’s situation as an ideal project for fiberglass. Harrington recommended Strongwell’s EXTREN® structural shapes due to pultruded fiberglass’ significant structural and architectural advantages over wood. 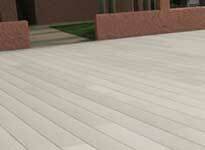 Unlike timber, EXTREN® does not rot or decay and EXTREN® is not susceptible to insect attack. Strongwell’s EXTREN® shapes are also stronger and more rigid than timber. Click here to read the full application profile. Switzerland-based Roth-Käse, an award-winning cheese manufacturer, used DURASHIELD® panels for walls in its U.S. location in Southern Wisconsin. The 3” foam-core panels were chosen because they are lightweight and can easily be removed for cleaning and moving equipment within the factory. 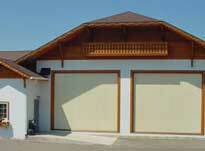 The panels also provide an aesthetically pleasing exterior appearance. 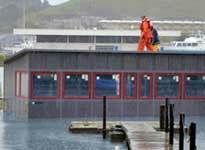 A floating office in the San Francisco Bay was constructed using the COMPOSOLITE® building panel system. The structure was designed using COMPOSOLITE® because it was less expensive than steel or concrete and easy to assemble. Strongwell’s DURAGRID® T-1700 pultruded grating was used to replace wood planks on a large walkway at Dinner Key Marina in Miami, Florida. The grating allows for easy accessibility to utilities below the walkway and will not rot like the previous wooden walkway. The grating also has a gray color that blends perfectly with the surrounding marina, creating a beautiful pier, as well as a functional one. Strongwell's engineering and manufacturing expertise allow the company to produce large tubes with thin walls, as shown at right. In this application, Strongwell worked with the customer to produce tubes that would be used to manufacture architectural columns. 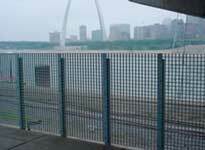 Metro, the transportation authority that serves the St. Louis, Missouri metropolitan area, recently undertook two large fencing installations utilizing custom DURAGRATE® molded grating as the main fencing component. Metro needed a functional fence that would keep pedestrians out but be aesthetically pleasing and not detract from the natural landscape. The attractive grid pattern of DURAGRATE® makes an excellent choice for various architectural applications, including fencing and visual screening.